I missed you all yesterday...I had my typical cooking marathon over the weekend and couldn't wait to share the photos with you yesterday but I couldn't keep a connection long enough to do that. So I will share today and throughout this coming week and hope you love all the things I made. Many of them came from my Mom's little recipe boxes which are so precious to me. I look through those little cards and almost every single one has a heart drawn on it or a little loving phrase or an "I love you" written on the back. It's as if she knew that one day I would still need to see those words when I didn't have her here to say them anymore. Mixed throughout the recipe cards are little notes to herself about what she wanted to teach me next. She so loved raising me...I was her last and she loved teaching me to cook and to garden and she especially loved teaching me about life. Her mission was to raise a daughter who valued every minute of her life and shared as much love as she could with the world. I hope I am making her proud. My Mom loved me with all her heart. Never in my lifetime will I find a love so profoundly deep. I cannot remember a moment in my life, before she left, that I didn't feel loved by her. It was a deep unconditional love that we shared with each other and I have never recovered from the loss. Oh, I know she is still here. I am sure of it....there are times that I get a strong whiff of her perfume out of nowhere....call me crazy if you will....but it is there and others have been here when it comes. There is no source from where it comes and no explanation....but I know beyond a shadow of a doubt it is my Mom that has come to say she loves me and that I am not alone. Sorry for all the melancholy this morning...just missing her today a little more than usual for some reason. 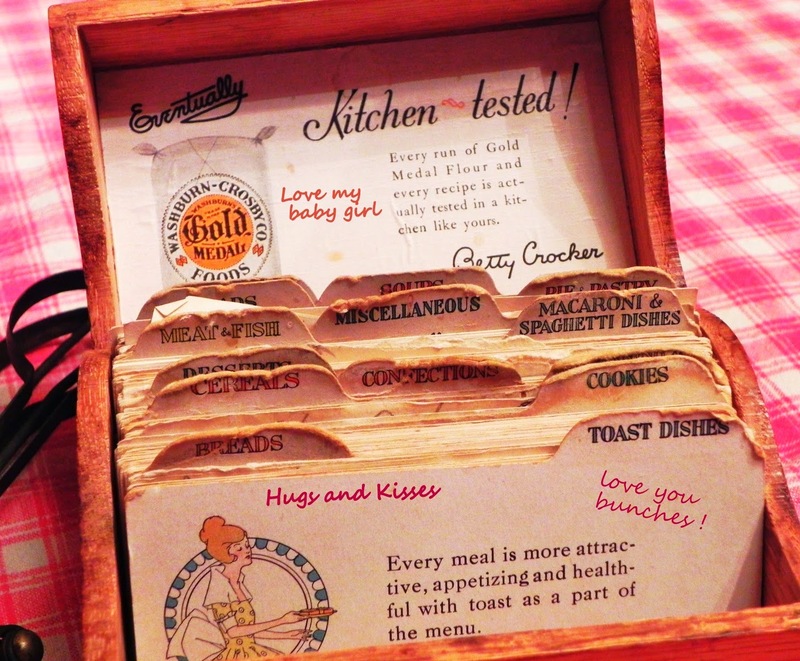 These recipe cards reek of love and warmth.